Candy and Blood is a collection of essays about one man’s prison experience over the past 12 years. Available for purchase on Amazon.com now! *Includes a 40-page glossary of prison terminology! These terms are defined in the glossary with hundreds more prison terms included. 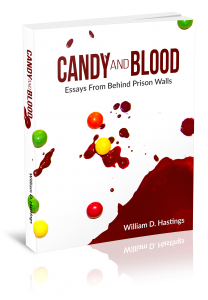 “In Candy and Blood: Essays From Behind Prison Walls, William D. Hastings destroys all illusions about jailhouse life. The essays in this collection are not fictional imaginings, but vivid personal snapshots of the penal system in America as recorded by a man who has been incarcerated since 2003. These gritty glimpses do not serve as an academic exposition of crime and punishment or a theoretical treatise on justice versus injustice, but rather, portray a microcosm of the human condition. Hastings writes with an intense honesty that is both refreshing and disturbing. Each installment describes uniquely surreal circumstances in which we are introduced to real-life characters who are vividly fleshed out by plainspoken eloquence and crackerjack storytelling. The author skillfully employs an array of literary devices; from one episode to the next, he switches from absurd hyperbole to graphic imagery and metaphors to grim-voiced, graveyard humor. His guileless, self-effacing confessional tone tugs heartstrings at one moment and is laugh-aloud hilarious the next. The eyewitness narrator pulls no punches as he effortlessly engages the reader. He confronts personal triumphs and failures head-on, but refrains from being self-indulgent. Instead, using articulate and finely tuned phrases, he addresses toxic problems such as bullying and racism in the context of how those all-too-prevalent societal ills are manifested on the wrong side of watchtowers and razor-wire. Prison is a world unto itself with its own unique culture and slang that can be largely confusing for a new inmate. Over a decade ago, William D. Hastings felt like the proverbial fish-out-of-water as he tried to navigate through this new prison world while learning the language of his fresh surroundings. On more than one occasion, he wished there was a dictionary he could consult to make life a little easier and conversations less confusing. Even though William D. Hastings was new to prison, he had cultivated a love of language his entire life. As such, Hastings took to learning the slang as a means of survival, but also really enjoyed mentally cataloguing this lexicon that was largely new and quite often confusing to him. Eventually, through years of thorough experience, Hastings became an expert with prison slang. These terms became so second nature to him that they peppered his everyday dialogue—even with his friends and family who had never been to prison and found the slang confusing at best. Realizing his strangely special circumstances and expert knowledge, William D. Hastings decided to compile a prison slang dictionary. The endeavor began as a bit of a laugh because Hastings figured, at most, he might be able to find a couple hundred terms unique to the inmate. The slang terminology of prison turned out to be much more widespread and diverse than he’d originally thought. Candy and Blood is a collection of essays written by the author of this site, prison-slang.com, about his prison experience over the past 12 years. Click on the image below to purchase Candy and Blood from Amazon.com!